Easy Cranberry Orange Apple Walnut Relish is the easiest, quickest recipe you’ll make for Thanksgiving or Christmas, but it’s so delicious that it will become a family tradition. Refreshing and palate-pleasing, a bite of Easy Cranberry Orange Apple Walnut Relish is the divine soulmate to a bite of turkey. It’s also the perfect foil to so many of the *heavy* fat-laden dishes, that cause our heavily-laden Thanksgiving tables to groan under the weight thereof. An additional reason I adore this dish is because my Mommy made it, and “ah hay-elped “! 🙂 I remember helping her crank the handle of the food grinder/food mill that was braced around the edge of the table in our basement, and tucking the slices of apple and orange into the feed tube. Happily for ALL of us, somebody invented the food processor, and now this dish takes all of about 30 seconds to prepare, once your ingredients are prepped.This is one of the recipes that nearly always sends at least one of my Thanksgiving guests over the moon. It’s sweet, tart, fresh, juicy, and crisp. It makes your taste buds stand up, salute, and break into the Hallelujah chorus. With all the carb-heavy, butter-laden dishes we typically serve on our Thanksgiving menus, this dish provides a welcome palate cleanse, in between bites. And no one can believe how easy it is to make! One Important Recipe Note: I make this EARLY in the week of Thanksgiving: usually on Monday. By that time, the vivid red color of the cranberries has penetrated all the apples and the oranges, and dish becomes a VIVID crimson! So it’s prettier than it was when you first made it, and all the flavors have a chance to mingle, and marry. 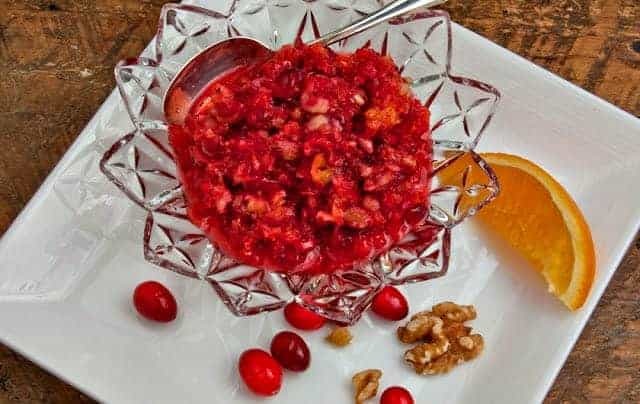 Easy Cranberry Orange Apple Walnut Relish is the easiest, quickest recipe you'll make for Thanksgiving or Christmas, but it's so delicious that it will become a family tradition. With a microplane zester, zest the outer peel off of two oranges. (Use the orange part only, not the bitter white of the pith underneath). then peel and section the oranges. Put cranberries, orange sections, zest, and apple slices into food processor and pulse until mixture is finely chopped, but not puréed. Add most of sugar and taste, adding more sugar to suit your taste. Stir in walnuts and refrigerate. 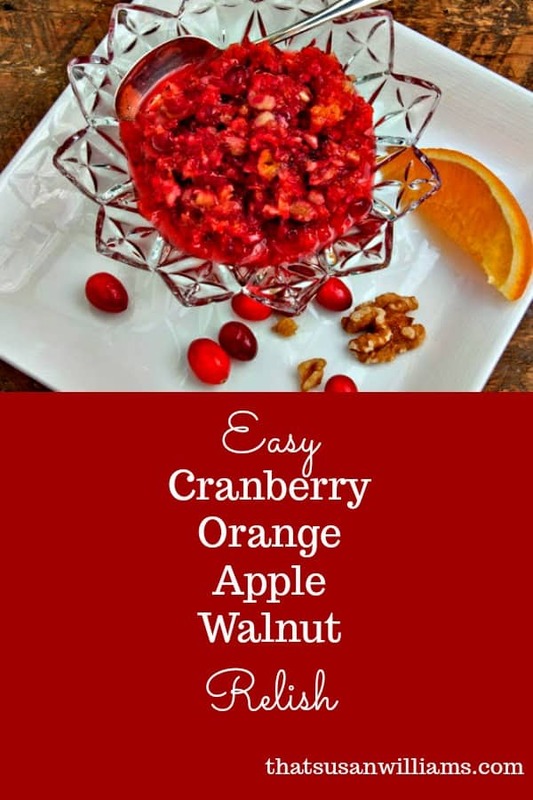 If you make this the day before (or a few days before), the color will be an even more brilliant red, as the juices of the cranberries work their way into the apple and orange. I usually make this on Monday or Tuesday of Thanksgiving week (but then, I have to keep my daughter out of it all week, till Thursday). Prepare early at your own risk: it may be hard to stay out of it. I make this several days before Thanksgiving, on Monday. By Thursday, it is a brilliant crimson color, and all the flavors have had time to marry. If you enjoyed this post or would like to save this recipe, I’d really appreciate it if you’d pin it on Pinterest!